I'm very excited to introduce this book and a new, promising author-- Kaitlin Bevis! In the next few days, I'll be posting a review of Persephone's sequel AND an author interview, so stay posted! Goodreads Book Description: There are worse things than death, worse people too. My Review: I was given this book by the author in exchange for an honest review. 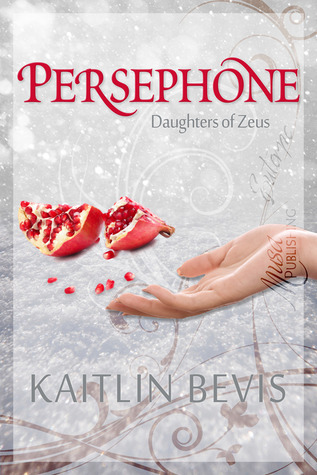 Persephone by Kaitlin Bevis is one of the most refreshing indie books that I've read in a while. It stars Persephone, unsurprisingly, who believes that she is just any other 16 year old girl until she finds out that she is actually a goddess! If you have read Greek myths at all, you will recognize characters from Hades to Charon. My favorites include Thanathos, Cassandra, and Helen. Persephone gets attacked by a fellow with wintery powers, and gets rescued by Hades. She wakes up in the Underworld. What happens next is terrific with some great twists that I definitely didn't see coming. I absolutely loved this gem of a book. What totally sealed the deal was Persephone herself. She is a terrific protagonist-- sweet but at the same time smart and witty. Bevis definitely has a turn of phrase. I laughed out loud at certain parts (especially at a particular exchange at dinner between Charon and Hades). Then near the end, when I was worried things would end up disappointing, Bevis makes some really great plot decisions, and cinched the elusive five stars from me. Minor spoiler: The only part I was slightly dubious about was a scene where Persephone is imagining a new wardrobe (she thinks it, and it appears as she sees in her mind). While I love that idea, I just see so many pitfalls with it-- wouldn't you imagine yourself naked in some inopportune moment just because you were trying NOT to think it? Overall, a witty, cleverly written ode to Greek myths with a terrific protagonist. I can't wait to see what Persephone has in store! Now enter a giveaway to win an e-copy of this book OR a $10 Amazon GC! I don't have a favorite; I love many of them. Umm, I don't really have a favorite myth....well, recently I was reading a few Greek myths and one of my favorites was the myth about Echo and Narcissus. But really, I love all myths! The Persephone myth has actually always been my favorite, just because there are so many different ways the story is told, some with her actually loving Hades and some with her hating him. I like Achilles especially the depiction in "Troy" which isn't totally accurate. I don't believe Achilles was as smart as Brad Pitt depicted him to be. i love the ones about hercules. I liked Eros and Psyche the most. :D Persephone and Hades comes second to me. I like Eros and Psyche the most! :) Persephone and Hades comes second. I love the Greek Myths especially in Young Adult fiction, like the 'Percy Jackson' series for example or'Descendants' trilogy. I would have to say that my favorite Greek Myth concerns the Trojan War as described in the poem 'Odyssey' concerning the Greek hero Odysseus. It describes his journey home after the fall of Troy. - This may be a more unusual choice, as many seem to reflect on the Gods of Olympus more than the Roman element. No favorites, but thanks for the giveaway. I haven't read any of this authors works but the synopsis sounds really interesting. I Cant Wait To Read Her Books. No favorite, I like a lot of them. Not joining the giveaway: hahaha imagining and being naked is a minor incident compared to other thoughts that might accidentally cross her mind. Persephone is one of my favorites! Thanks for the chance to win! I don't really have a favorite, I just LOVE Greek mythology!! Hmmmm that's weird. My comment must have gotten lost in the web-universe, as I don't see it here. lol. Well, I had made a comment saying that my favorite was Eros & Psyche and the Greek mythology of Daphnis. I like Pandora's Box because it is such a good metaphor. I also like Orpheus since I am a musician. I like Pandora's Box because it is such a nice metaphor. I also like Orpheus since I am a musician. I'm a fan of all myths, both the old tellings, and the modernized ones. They are all so much fun! I loooooove Greek myths. I can't really pick a favorite. I love all of the myths! Persephone and Midas Touch. thanks! I've always loved all of them. They're all so fascinating. It would be so hard to pick only one. I love all of them, but a particular one I have a love for is the tale of Icarus. The innovation displayed there is amazing! I've always annoyed reading about Persephone, and I like the message behind the stories of Narcissistic. My favorite goddess is probably Athena.